[한국과 4차 산업혁명 <12-1 뷰티>] ‘뷰티 앤 사이언스’ … 아름다움은 당신의 눈 속에 있다. One corner of Aritaum’s flagship store in Gangnam, southern Seoul, resembles a scientific laboratory with white walls, a large desk, consultants in white lab coats and a device known as a facial skin analyzer. This is the Iope Bio Lab, where people can take skin tests and receive Iope’s product samples to treat various skin conditions. 서울 강남에 위치한 아리따움 플래그십 스토어의 한 코너에는 실험실 같은 공간이 있다. 하얀 벽과 커다란 책상, 흰 가운을 입은 컨설턴트와 피부 측정용 기기가 있는 곳이다. 이곳은 아이오페 바이오랩이다. 여기서 고객들은 자신의 피부 측정을 받고, 결과에 따라 아이오페 샘플 제품을 받아간다. “여기 보시면 눈가와 볼 주변 피부에는 피지가 거의 없는 게 보이실 거예요. 그러니 고객님은 필링 제품 사용하실 때 그 부위는 피하셔야 해요. 오히려 피부를 자극할 수 있어요.” 이곳의 컨설턴트는 피부 테스트를 받고 있는 기자에게 이렇게 말했다. The facial skin analyzer showed sebum inside the pores in red. The 60-minute course provided details about wrinkles, pores, pigmentation and moisture. 이 얼굴 피부 분석기는 피지가 있는 모공을 빨간색으로 표시해 보여주고 있었다. 60분에 걸쳐 진행되는 이 코스는 기자 얼굴의 주름, 모공, 색소 침착 정도와 수분 함유량을 자세하게 알려줬다. Among the seven Iope Bio Labs nationwide, the Myeong-dong branch offers a 90-minute intensive course that includes a one-on-one consultation with skin experts who hold graduate degrees in pharmaceuticals and bio science. Reservations for this particular branch were fully booked through July. 아이오페 바이오랩은 전국에 모두 7곳이 있다. 서울 명동점에서는 90분짜리 인텐시브 프로그램을 제공한다. 일반 60분짜리 코스와 달리 인센티브 코스는 추가 30분 동안 생명과학과 약학에 석사 이상의 학위를 가진 연구원들이 일대일 피부 상담을 해준다. 아이오페 명동점의 바이오랩은 벌써 이달 말까지 예약이 다 차 있다. In the beauty industry, bespoke products are the new trend and since last year, companies like AmorePacific, LG Household and Health Care have begun to provide customized skin serums, moisturizing creams and lipsticks. 맞춤형 화장품이 뷰티 업계의 트렌드로 떠올랐다. 지난해 이후 아모레퍼시픽·LG생활건강 등 국내 화장품 업계의 선두 주자들은 개인 맞춤형 세럼, 수분크림, 립스틱 등의 제품을 내놓기 시작했다. According to a report last year by the Korea Cosmetic Industry Institute, Korean woman typically express seven different concerns regarding their skin, including spots, darkness and wide pores. 대한화장품산업연구원이 지난해 발간한 ‘한국인 피부측정 및 설문조사 보고서’에 따르면 한국 여성은 잡티, 칙칙함, 모공 확장 등 평균 7개의 피부 고민을 갖고 있다. 아모레퍼시픽 관계자는 “피부 관리 방법이 워낙 다양해지다 보니 젊은 세대 사이에는 자신의 피부에 잘 맞는 최적의 방법을 찾는 맞춤형 화장품에 대한 관심이 커지고 있는 것 같다”고 말했다. “The desire to find a product that perfectly fits one’s needs before actually making a purchase is more common in Korea than in other countries,” said Kim Jung-eun, founder of Powder Room, Korea’s biggest online community for cosmetics, with more than 1.7 million members. “한국은 제품을 구매하기 전에 자신에게 꼭 맞는 제품을 찾아보는 ‘화장품 소비 전 단계’가 매우 발달돼 있다.” 온라인 뷰티 커뮤니티 ‘파우더룸’의 김정은 창업자는 이렇게 말했다. 파우더룸은 170만 명이 넘는 회원을 거느린 국내 최대 뷰티 커뮤니티다. 그는 “미국이나 유럽 지역의 경우 구매 사이트 안에 제품 리뷰가 녹아있긴 하지만 뷰티 커뮤니티나 리뷰 사이트가 단독으로 존재하는 경우는 매우 드물다”며 “이는 한국의 뷰티 산업이 매우 발달했으며, 소비자들이 트렌드에 민감한데다, 한국 여성들이 서로 정보 나누는 걸 좋아하기 때문”이라고 말했다. With the advent of smart phones and certain internet platforms, access to such information has become easier than ever before. Before YouTube, for example, cosmetics reviews were mostly made up of online blogs, but now many have shifted to video. 스마트폰 및 강력한 인터넷 플랫폼의 등장 이후 소비자들의 정보 접근성은 그 어느 때보다 높아졌다. 소비자 리뷰의 지평도 변화했는데 그 한 가지가 바로 유튜브다. 이전에 화장품 리뷰의 대표 미디어는 블로그였다. 하지만 스마트폰이 대중화된 이후 과거의 블로거 상다수가 영상 미디어를 이용하고 있다. As a result, YouTube personalities who specialize in reviewing such products, such as Pony and Ssin, have reached incredible heights; Pony now has 2.7 million subscribers, while Ssin has 1.3 million. Both attach English subtitles to their videos and a lot of the comments below are from foreign fans written in English. 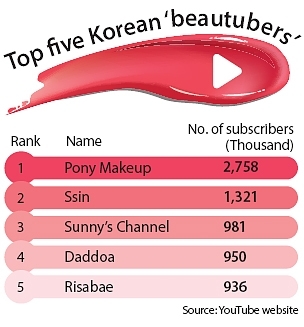 Korea’s top five beauty YouTubers, called “beautubers” for short, all have at least 900,000 subscribers. 유튜브에서 주로 뷰티 제품 리뷰를 하는 일명 ‘뷰튜버' 중 가장 많은 구독자를 갖고 있는 사람은 ’포니‘와 ’씬님‘이다. 포니는 현재 270만 명, 씬님은 130만 명 이상의 구독자를 거느리고 있다. 이들을 포함해 상위 5명은 모두 90만 명 이상의 구독자를 갖고 있다. For example, Ssin is famous for tutorials on how to imitate makeup used by K-pop celebrities, including boy band singers like G-Dragon. An outspoken character, some of her reviews are so frank that she does not hesitate to openly criticize poor-quality brands. 각각의 뷰튜버는 자신만의 개성이 있다. 예를 들어 씬님은 남성 아이돌인 지드래곤을 포함해 유명 한류 스타들의 메이크업을 재현하는 걸로 유명하다. 걸쭉한 입담과 브랜드를 서슴없이 비판하는 솔직한 제품 후기도 매력으로 꼽힌다. The growing popularity of these beautubers reflects a change in the demographics of those interested in beauty products. A recent trend in the Korean beautuber scene is the advent of male hosts, from former comedian Kim Ki-su, who uploads tutorials using bold color cosmetics, to Cosmetic Reader, who provides detailed lectures on skin care and acne — demonstrating the growing market of men’s cosmetics. Indeed, sales of men’s cosmetics at Olive Young grew at an average of 40 percent annually between 2014 and 2016. 뷰튜버들은 화장품 소비층의 저변 확대를 반영한다. 남성들의 화장품에 대한 관심이 커지면서 남성 뷰튜버도 출현했다. 과감한 색조 화장을 즐기는 개그맨 김기수부터 기초 화장품과 스킨 케어 전반을 상세하게 다루는 ‘화장품 읽어주는 남자’까지 활동 영역도 세분화돼 있다. 한국 남성 화장품 시장은 계속 커지고 있다. 실제로 올리브영의 남성 화장품 판매량은 2014년부터 2016년까지 매년 평균 40%씩 증가했다. Mobile applications that rank and analyze beauty products, such as Hwahae, are another way technology has made reviewing cosmetics easier. Hwahae, downloaded over one million times on Android’s app market, has over 2.2 million five-star rating reviews and ingredient analyses of over 87,000 products. For every product, the app shows a full list of the substances it contains with a one-to-three scale indicator of harmfulness to the skin. Most ingredients rated “dangerous” are additives used to impart certain colors or scents. 화장품을 평가해 순위를 매기고, 성분을 분석하는 화장품 리뷰 전용 모바일 애플리케이션도 있다. ‘화해’는 안드로이드 앱 마켓에서 100만 회 이상 다운로드 된 인기 리뷰 앱이다. 화해는 220만 개 이상의 평점을 보유하고 있으며 제품의 성분 분석 건수는 8만7000건이 넘는다. 이 앱은 각 화장품의 성분을 모두 공개하고, 해당 성분의 위험도를 ‘낮은 위험도’부터 ‘높은 위험도’까지 3단계로 나누어 표시한다. ‘높은 위험도’의 성분 대부분은 향이나 색상을 내기 위한 첨가제들이다. Son Min-young, 24, said she uses the application every time she buys cosmetics. “Even in stores, if I find something I want to buy I check the product on Hwahae first to see if there are any harmful ingredients,” she said. Son added that as a result, she changed the foundation she had long been using after checking its ingredients using the app. 화장품을 구매할 때마다 앱을 본다는 26세 손민영씨는 “매장에 가서도 사고 싶은 제품이 생기면 우선 앱을 열어서 해로운 성분이 들어있는지 확인한다”고 말했다. 그는 화해에서 성분을 확인한 후 오랫동안 사용하던 파운데이션을 바꾼 적도 있다. Beauty brands are also upgrading their products and services to satisfy consumers’ desire to understand skin in detail and therefore be able to use products with greater expertise. 화장품 회사들 역시 자신의 피부를 세세하게 파악하고 더 전문적인 지식을 바탕으로 제품을 선택하려는 소비자들의 욕구를 충족시키기 위한 제품과 서비스를 개발하고 있다. WaySkin is a donut-shaped device that detects the moisture level of one’s skin when gently pressed against one’s face. Sensors on the other side of the device detect environmental factors like humidity or UV light. The smartphone app connected via Bluetooth then alerts the user when it is time to rehydrate the skin or reapply sunscreen. 도넛처럼 생긴 ‘웨이스킨’이라는 기기를 얼굴에 살짝 갖다 대면 피부의 수분도를 확인할 수 있다. 기기의 반대 쪽에 있는 센서는 습도나 자외선 등 외부의 환경적인 요인을 측정한다. 블루투스로 스마트폰과 연동하면 기기는 환경 변화에 따라 ‘피부에 수분을 보충하라’거나 ‘썬크림을 다시 바르라’고 알려준다. “Unlike wrinkles or pores, moisture level is a factor that may change on a daily basis and an influencer to many other skin troubles,” said WayWearable CEO and Founder Jason Moon on why he chose to focus the device on measuring moisture as opposed to other skin factors. 수분도를 측정하도록 설계한 이유에 대해 이 제품을 제조한 ‘웨이웨어러블’의 문종수 창업자 겸 대표는 “얼굴의 주름이나 탄력은 매일 변하지는 않는다. 하지만 수분은 매일 변화하고, 주름이나 색소 등 얼굴 피부 전반에 영향을 끼치는 요소이기 때문”이라고 답했다. Other devices use cameras to take measurements. Made by a Taiwanese company of the same name, HiMirror is composed of a large mirror-like screen attached to a round camera on top. Upon holding up one’s face in front of the camera for three seconds, the device will analyze the user’s skin on five criteria, including brightness, clarity and firmness, rating them on scales of one to 100. 피부 측정을 위해 카메라를 이용하는 기기도 있다. 대만의 스타트업이 만든 ‘하이미러’는 이름 대로 거울 겸 화면 위에 카메라를 덧댄 형태의 전자기기이다. 이용자가 카메라 앞에 얼굴을 3초 동안 대면 기기가 안색, 투명도, 탄력 등 5가지 척도를 기준으로 얼굴을 측정해 그 결과를 1부터 100 사이의 점수로 표현한다. As it saves its results, the mirror also shows which skin factors have improved or worsened compared to previous tests, and if you register your products at home via the app, it also devises a personalized skin care regime based on those items. 측정 기록을 저장하기 때문에 시간의 흐름에 따른 개선 여부를 알 수 있는 것이 장점이다. 연동된 모바일 앱을 통해 보유한 스킨케어 제품을 등록하면 측정 결과를 토대로 제품 사용 순서나 사용법 등을 알려주기도 한다. One interesting recipient of this year’s CES Innovation Awards was a hairbrush. Co-developed by L’Oreal and French tech company Withings, the Kerastase Hair Coach identifies frizziness, dryness or split ends by capturing soundwaves made when the brush combs through the hair. 올해 CES에서 혁신상을 받은 제품 중 하나는 머리빗이다. ‘케라스타즈 헤어 코치’는 로레알과 프랑스의 웨어러블 제조업체 ‘위딩스’가 만든 제품으로 빗이 머리 사이를 지나갈 때 내는 소리와 음파를 바탕으로 머리카락의 부시시함, 건조함, 갈라진 머리끝을 감지한다. It also detects movement and alerts users with vibration if their brushing motions are too rough. Users also receive tips on brushing habits and product recommendations through the Kerastase mobile app. 빗의 움직임도 감지하기 때문에 너무 세게 머리카락을 빗으면 이를 저지하기 위해 진동으로 경고한다. 사용자들은 앱을 통해 머리카락을 올바르게 빗는 방법과 케라스타즈의 제품 추천을 받을 수 있다. Conducting skin measurements in person is particularly spreading among leading companies at their brick-and-mortar stores. Like AmorePacific’s Iope Bio Lab, LG Household and Health Care’s CNP Cosmetics makes personalized serums on demand based on skin tests conducted on site. 매장에서 피부를 측정해 주는 서비스는 대형 화장품 업체들 사이에 활발하게 이뤄지고 있다. LG생활건강의 CNP차앤박 화장품은 ‘르 메디 바이 CNP’라는 브랜드를 통해 매장에서 개인 맞춤형 세럼을 제조한다. The 50-milileter bottle, later attached with a label of the consumer’s name, is made with one of three base serums and two among five functional ampules. 상담 결과와 피부 측정 결과에 따라 세 개의 기본 세럼 중 하나와 다섯 개의 기능성 앰플 중 두 개를 골라 50mm 병에 해당 고객의 이름이 프린트 된 라벨을 붙여 준다. Local start-up Toun 28 took personalization to a new level by measuring different parts of the face along with environmental factors like temperature, humidity and UV to produce new products for each consumer. 국내 스타트업 ‘톤28’은 한층 심화된 개인 맞춤 서비스를 제공한다. 고객의 얼굴을 부위별로 나눠 측정, 온도·습도·자외선 등의 환경 변화를 반영해 고객 개인별로 스킨케어 제품들을 다르게 제작한다. The company offers a subscription for which a consultant first measures four parts of the face — chin, forehead and the areas around the eyes and mouth — then sends products every one to three months according to the test results, combined with Toun 28’s algorithm, which predicts the consumer’s needs based on seasonal changes. 이 회사는 구독형 서비스를 제공한다. 서비스를 신청하면 우선 컨설턴트가 고객의 턱·이마·눈 주변과 입가를 나누어 피부 측정을 한다. 그리고 나면 고객은 계절별로 자신의 피부가 어떻게 변할지를 예측하는 톤28의 알고리즘에 따라 1~3개월 간격으로 그에 맞는 제품을 제공받는다. 톤28의 공동창업자 정마리아 씨는 “한국인의 절반은 건성이나 지성이 아닌 복합성 피부를 갖고 있다. 한 부위가 건성이어도 다른 부위는 지성일 수 있다”고 설명했다. The development of personalized cosmetics abroad is concentrated on color cosmetics, as regulations for mixing new skin care products on demand are restricted in most countries. U.S.-based MatchCo and Lancome both make foundations that perfectly match one’s skin color based on scientific tone assessments. 해외에서 대부분의 맞춤형 뷰티 제품은 색조 화장품을 위주로 발전하고 있다. 대부분의 국가가 기초 제품의 경우 맞춤형 화장품 제조를 금지하고 있기 때문이다. 미국 스타트업인 ‘매치코’와 랑콤은 둘 다 과학적인 색 측정 기술에 기반해 소비자의 피부색에 맞는 맞춤형 파운데이션 서비스를 제공한다. Lancome’s Le Teint Particulier is made and mixed at the store upon scanning shades at certain Nordstrom stores in the U.S. MatchCo enables users to send skin tones via smartphone and mobile camera. 랑콤의 맞춤형 파운데이션인 ‘르 테인트 파티큘리에’는 미국의 유통업체 노드스트롬 매장에서 제작이 가능하다. 매치코는 모바일 앱으로 소비자들의 피부색을 전송받는다. Customizing products according to genetics analysis is another area beauty manufacturers are eyeing. AmorePacific and LG Household and Health Care both found partners in genetics research and bioengineering last year to boost research in this area. 유전자 맞춤형 화장품 역시 뷰티 업계에서 미래 먹거리로 손꼽히는 분야다. 아모레퍼시픽과 LG생활건강은 지난해부터 유전자와 생명공학 연구소들과 공동 연구를 진행 중이다. The first local company to launch in this area is Hankook Cosmetics, which unveiled the brand “Generte” in April. The analysis is done after consumer gargle liquid, which is used to provide information on skin firmness, the degree of aging and pigmentation. Then consumers receive proposals of one among 120 skin care product routines. 유전자 화장품의 상용화를 처음 실현한 회사는 한국화장품이다. 지난 4월 런칭한 브랜드 ‘제네르떼’는 가글을 이용해 소비자의 유전자 정보를 추출하고 이를 토대로 피부의 탄력, 노화, 색소 침착에 대한 정보를 알아낸다. 소비자들은 그에 따라 120가지의 제품 조합 중 하나를 추천받는다. Despite the marketing buzz and competition among local companies, industry insiders say personalized cosmetics in Korea is still in its infancy, and that there needs to be more data in order for customized cosmetics to truly cater to personal skin features. 맞춤형 제품을 위한 국내 업체들의 경쟁에도 불구하고 업계 관계자들은 여전히 국내 맞춤형 화장품 시장이 태동기에 있다고 평가한다. 진정한 의미의 개인 맞춤형 화장품을 위해서는 아직도 더 많은 소비자 정보가 축적돼야 한다는 것이 전문가들의 공통적인 의견이다. One reason there is not sufficient data is because it has not been long since the Ministry of Food and Drug Safety officially allowed on-demand production of customized cosmetics. The system is still in its test-operation and only companies registered with the ministry in advance can offer such services. So far, only 30 have done so. 소비자 정보가 충분히 축적되지 않은 이유 중 하나는 맞춤형 화장품이 국내 업계에서 허용된 지 얼마 안 됐기 때문이다. 식품의약품안전처는 지난해 맞춤형 화장품 판매 활성화를 위한 시범사업에 착수하면서 신청한 업체들에 한해 맞춤형 화장품 제작을 허용했다. 여전히 제도는 시범 단계에 있으며 현재 30개 업체가 등록돼 있다. But regulating customized skin care products raises complex issues, the first being safety. If cosmetics are made differently each time according to the consumer, this may create a gray zone in terms of quality control, which for mass-produced products can be more easily done at once. 맞춤형 화장품에는 몇 가지 민감한 이슈가 있는데 그 중 하나는 안전성이다. 피부에 닿는 제품을 각각의 소비자에 따라 모두 다르게 제조한다면 품질 관리에 구멍이 생길 수 있다. “아무 가게에서나 ‘이러이러한 제품이 당신에게 맞습니다’라고 여러 브랜드의 제품을 섞어서 줬을 때 문제가 되면 누가 품질관리를 한 건지, 누가 책임을 질 건지에 대한 문제가 발생할 수 있다”라고 식약처 관계자는 말했다. The second question is the efficacy of personalized beauty products: Can the assertions of research institutes that develop these products, mostly part of big cosmetics companies so far, be acknowledged as scientifically objective? 두 번째 문제는 맞춤형 화장품의 효과성 입증이다. 현재까지 대기업들이 내놓은 맞춤형 화장품들의 효과성을 입증한 기관이나 전문가 집단에 객관성을 부여할 수 있을까. 그 결과들이 과학적으로 유의미하다고 볼 수 있을까. When discussing a product’s clinical efficacy on the skin, there needs to be a figurative measurement of how much improvement the product has incurred and whether that change is meaningful compared to other products. 스킨케어 제품의 임상적 효과를 입증하려면 그 제품이 피부에 가져온 개선 정도를 수치적으로 나타낼 수 있어야 한다. 변화 정도가 기존 제품의 효과를 썼을 때와 비교했을 때 유의미한지도 살펴봐야 한다. But because customizing skin products is still a new practice, there is not enough consumer data or a standard system to clinically assess how effective these products are. 하지만 맞춤형 화장품 자체가 등장한 지 얼마 안 됐기 때문에 임상적으로 유의미한 숫자들을 비교하기에는 소비자 측정 자료가 미비하고 측정 방법도 충분히 개발되지 않은 것이 현실이다. 성신여대 뷰티산업학과의 김주덕 교수는 현재 대기업들이 맞춤형 화장품을 위해 측정하는 피부 요인들은 진정한 의미의 맞춤형 화장품을 만들기에는 너무 사소한 변수라고 지적한다. 그는 “근본적으로 진짜 맞춤형 화장품을 만들려면 노화도를 정확히 측정해야 하는데 지금은 그렇게까지 하기에 기술적으로 제도적으로 여건이 마련되지 않았다”고 말했다. 대한화장품산업연구원의 손성민 연구원은 “제품의 안전성과 기성 제품과의 차별화를 통한 유효성 입증이 가장 먼저라고 본다. ‘과연 내가 쓰는 제품보다 정말 더 효과적인가?’에 대한 신뢰가 생기면 시장 확대는 얼마든지 가능하겠지만 우선 무엇보다 기술 개발 등 과학과 마케팅이 융합돼야 한다”고 말했다.